Rescuers Search For Survivors After Mudslides In Colombia Kill At Least 200 : The Two-Way At least 43 children are among the dead after floods and landslides tore through the town of Mocoa. President Juan Manuel Santos is promising to rebuild. 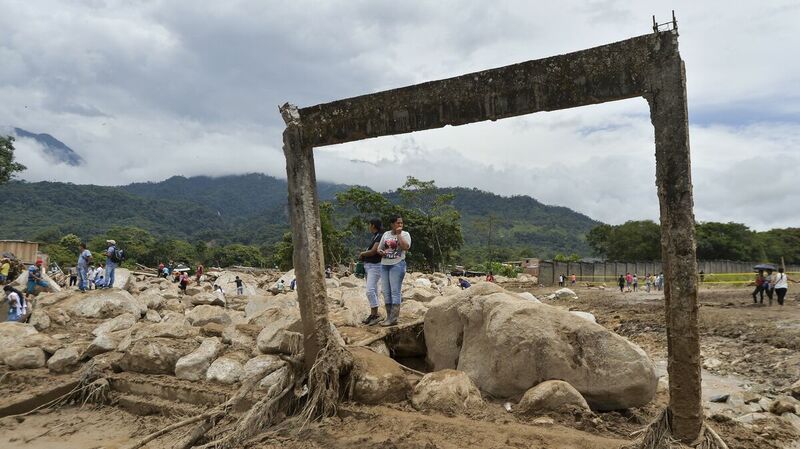 On Sunday, women stare at damage caused Friday night by mudslides following heavy rains in Mocoa, southern Colombia. 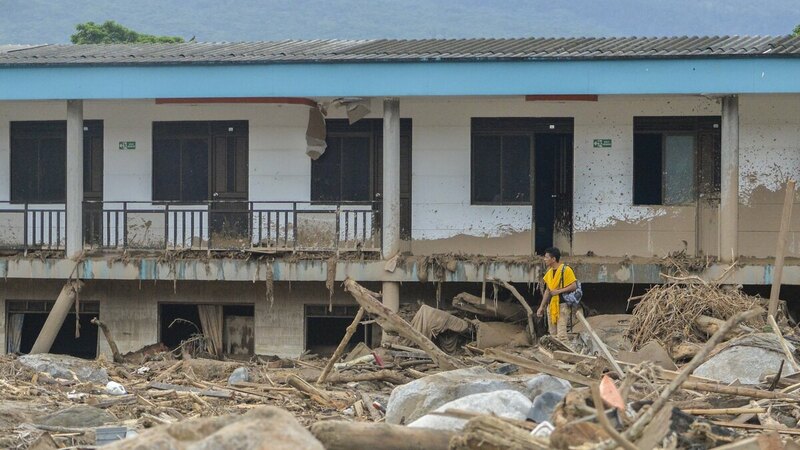 Two days after landslides and floods tore through the town of Mocoa, Colombia, and killed more than 200 people, rescuers were desperately searching for survivors in the mud and rubble. The "sudden avalanche of mud and water" struck on Friday night, as people were sleeping, as NPR reported over the weekend. The death toll includes at least 43 children, John Otis reports for NPR. "Hundreds are still missing after rivers overflowed Friday night, sending water, mud and boulders crashing through Mocoa," Otis says. "About half of the town's neighborhoods were damaged or completely wiped out." Family members and rescue teams were frantically looking for survivors, as the clock is ticking to save anyone who survived the initial catastrophe. The death toll is expected to rise as search efforts continue. The BBC reports that more than 1,000 police officers and soldiers were involved in rescue efforts, and the Colombian Red Cross was working to help connect family members. 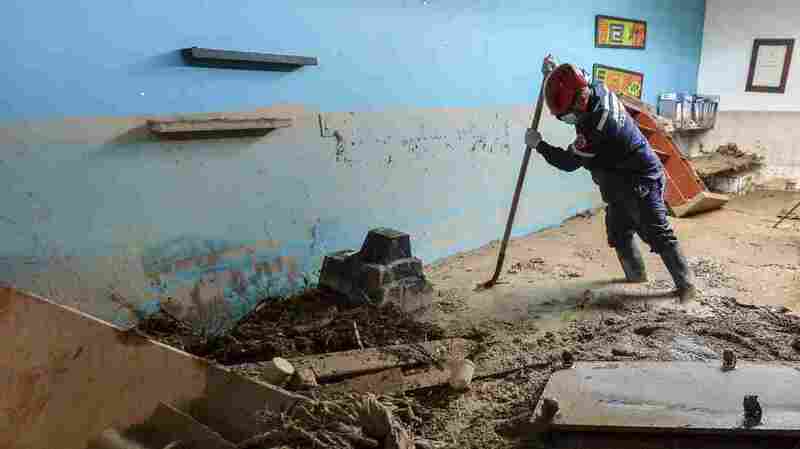 A fireman searches for victims inside a muddy house, following mudslides caused by heavy rains in Mocoa, Putumayo department, southern Colombia, on Sunday. Rescuers are clawing through piles of muck and debris in search of survivors. "Dozens stood in the door of a hospital, hoping for news of family members who were not on the list of those confirmed dead or injured. Others frantically knocked on relatives' doors, hoping to find someone with information about their loved ones. "A rescue worker in an orange jumpsuit emerged from one search area with the body of an infant wrapped in a towel. Not far away, Abelardo Solarte, a 48-year-old resident of Mocoa, held a child's shoe as he helped clear debris.
" 'You have no idea how many kids there are around here,' Solarte said." Colombia's El Tiempo described the scene on Sunday as "desolation, impotence and one last hope. ... On every corner there was someone mourning the death of a relative or a friend, or the sudden loss of the product of an entire lifetime's work." World leaders, including Pope Francis, have offered their condolences and support, Otis reports from Bogota. "During a visit to Mocoa, President [Juan Manuel] Santos said workers are starting to rebuild bridges, restore electricity and provide emergency housing," Otis says. The death toll from a devastating Friday night landslide in the Colombian town of Mocoa stood at more than 200, as rescuers clawed through piles of muck and debris in search of survivors. Critics of Santos have said the government should have done more to protect the region from this kind of disaster, the BBC reports. A U.N. official pointed to climate change as an underlying cause of the flooding and landslides, while a conservationist cited deforestation. "Mocoa is vulnerable to flooding. It is surrounded by the three rivers in a natural basin created by the surrounding mountains. "A 1989 hydrology report for the Agricultural Ministry warned that just such a disaster could happen unless steps were taken to reinforce the riverbanks, channel water away from the town and restore some of the forest. It was not immediately clear why those steps had not been taken."